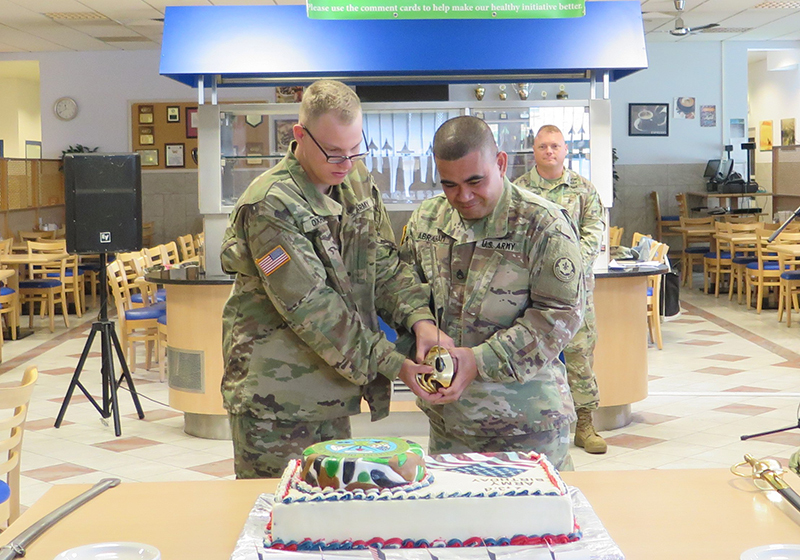 GRAFENWOEHR, Germany — U.S. Army Garrison Bavaria celebrated the U.S. Army’s 243 years of service to our nation June 14, 2018, at the Stryker Inn Dining Facility on Rose Barracks. “Today, the U.S. Army continues to lead the way in the effort to secure a more stable, peaceful world, and as always stands ready and able to defend our Country and Constitution against all enemies, foreign and domestic,” said 2nd Lt. Benjamin Solem, 2CR’s narrator for the event. As the guest speaker, Command Sgt. Maj. Micheal Sutterfield, USAG Bavaria’s command sergeant major, spoke of the importance of the Army from its foundation to its current status as the key fighting force in the world and honoring our Soldiers’ impacts to today’s Army.